In this lesson we discuss the uniqueness of the fretboard and how it affects the study of improvisation on the guitar. So you can see that thinking in terms of pure pitch content can be very frustrating on the guitar. That’s the reason why many perfectly good improvisation methods cannot easily be applied on our instrument. I myself dedicated a few years working on the pitch content approach almost exclusively, so that I could apply all the jazz and improvisation theory I learned in college. So instead of thinking like normal guitar players, I tried to see the right notes and play without using any shapes. And after I tortured myself for hundreds of practice hours, I got to the point where I could do this to a degree, even over songs with complex chord changes, but I was still kind of slow with keys that had a lot of sharps and flats, or if the changes were going by very fast. My intellectual approach seemed very impressive to my guitar friends, but compared to the average piano player, or a jazz horn player, I was still an amateur. It’s only after I discovered SFS and applied it the way I’m going to show you here, that handling all keys became natural and easy enough to learn with a very reasonable amount of practice. So no more stumbling in the dark, no more feeling that guitar players are the uneducated ones in the band, now we are ready to embrace and take advantage of the guitar’s unique fretboard logic and learn to navigate chord changes. 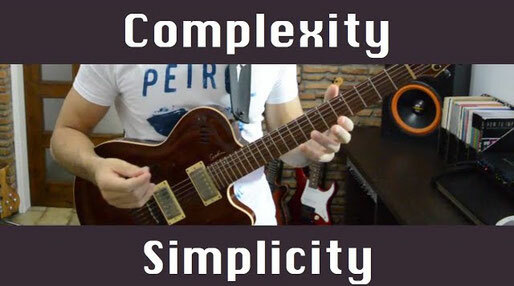 The video above an excerpt from the introduction of my "SFS Pentatonics 2 - Navigating Chord Changes” video course. If you are interested to learn more about SFS, I’m offering a free lesson series that you can check out, called the SFS Pentatonics Crash Course. You can use the link below to sign up. SFS is a great system and has helped many of my students, and my online viewers, improve their soloing skills and learn to move everywhere on the fretboard in record time, so I hope to see you there.